The radio … the phonograph … now the Internet. They make us think of music as something that comes to us from somewhere else. 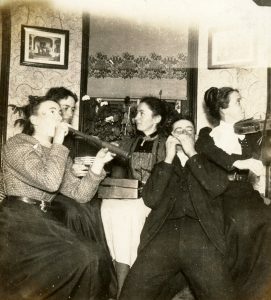 But beneath the screech and rumble of the media, people have gone on making their own music with their family, friends, and neighbors. It’s nothing special, just people pulling out guitars, banjos, fiddles, or simply their voices and singing old songs they learned at their mother’s knee or new ones they just heard from the guy down the street. Cornwall has had plenty of it over the years – and it still does. 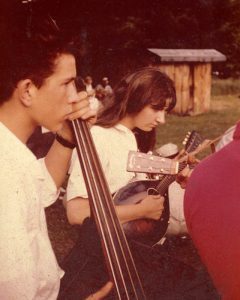 Lorraine Hammond at the Canaan Valley Jamboree, ca. early 1960s. Lorraine Choiniere Hammond, nationally-known folksinger, teacher, and songwriter, grew up in Cornwall amid its ballad singing, fiddle playing, and square dances–some even in the Covered Bridge! Lorraine returned to Cornwall to interview and record the musicians she had known as a child and has helped pass the music on in the Cornwall community–our well-known “Still, The Homegrown Band” was inspired by her Cornwall homecoming performances. Lorraine remembers: My childhood was rich with people making their own music. There were square dances at Hart’s barn, and families and friends gathered to sing and play. Twins Pat and Biddy Bierce played mandolin together. Their sister-in-law Sylvia Bierce played organ and directed the choir for the Second Congregational Church. I loved singing in that choir, loved the choir rehearsals at the Bierce’s little house.The traditional delivery style of Oscar Degreenia’s unaccompanied ballad singing, the soaring voice of Comfort Starr’s fiddle, and the cheerful pluck of Pat and Biddy Bierce’s mandolins were all part of the musical soundtrack of my childhood. Oscar Degreenia was a Cornwall ballad singer who had some of his repertoire recorded by Vermont ballad collector Helen Flanders in the 1940s and 1950s. Lorraine sings many of Oscar’s ballads as part of her performance repertoire. of the [Scoville] farmhouse. When we were all seated, with Mrs. Hedden at the piano, the well-worn 1886 Gospel Hymns were passed around. They might have been heard a mile away. And must have ripped to rags everyone’s tensions for the whole next week. But Cornwall’s homegrown music is not just something of the past. “Still, the Homegrown Band” conducts a monthly contradance in the town hall. Cornwall Bridge hosts a regular sing with guitars and banjos. Yelping Hill often earns its name with sings and jam sessions. In the summer of 2018, many Cornwall residents worked with Lorraine to find and showcase Cornwall’s homegrown music. The choir of the UCC church in Cornwall village sang hymns that were sung in the Scoville farm house over a century ago. The Cornwall Historical Society presented an exhibition called Ballads and Barn Dances: Cornwall’s Homegrown Music that documented how Cornwall has kept its local music alive over the past century and more. Still, the Homegrown String Band presented a dance for kids, followed by an open mike for local singers and songwriters. And Lorraine and Bennett Hammond presented their third homecoming concert, featuring ballads of Oscar Degreenia and original songs by Lorraine about growing up in Cornwall, followed by a group sing. Interview: Why Cornwall Homegrown Music? This webpage started as a reproduction of the 2018 exhibition, but we’ve begun to add other material, much of it from people who heard about the exhibit and sent us additional photos, recordings, and memories. After Lorraine and Bennett’s 2018 homecoming concert, the idea started popping up: Let’s do this again next year. Plans are now underway for a 2019 Cornwall Homegrown Music weekend. We hope this webpage will continue to incorporate new material from the past – and from the future.